Since the 1970s, the auto industry has made a series of efforts to solve the problem of fuel and fuel vehicle pollution. And electric cars emerge at the current auto industry level. So the future development of electric cars and FRP are inextricably linked. At present, the application of FRP in automobile industry mainly includes several aspects. 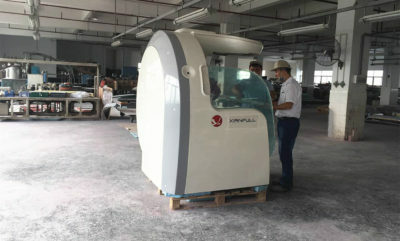 For example, fiberglass body parts like fiberglass bumpers, fiberglass headliner, fiberglass kit, DIY fiberglass hoods, fiberglass truck body, etc. 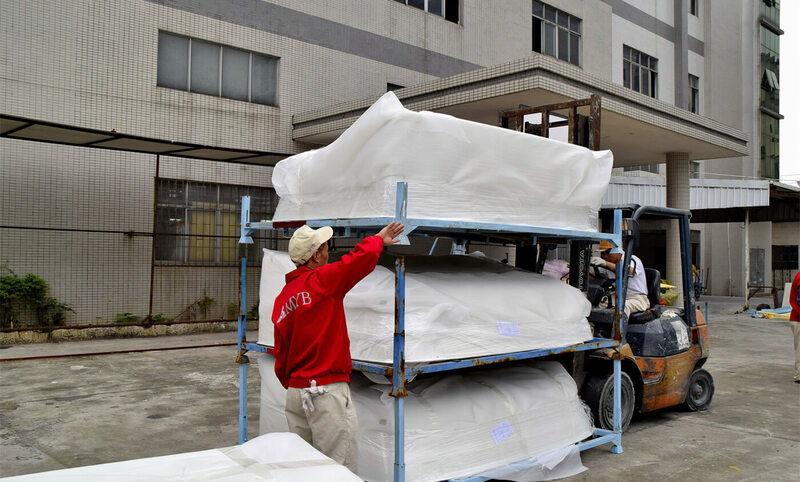 These fiberglass supplies from us Dongguan MIYABI-FRP Limited have been ample. 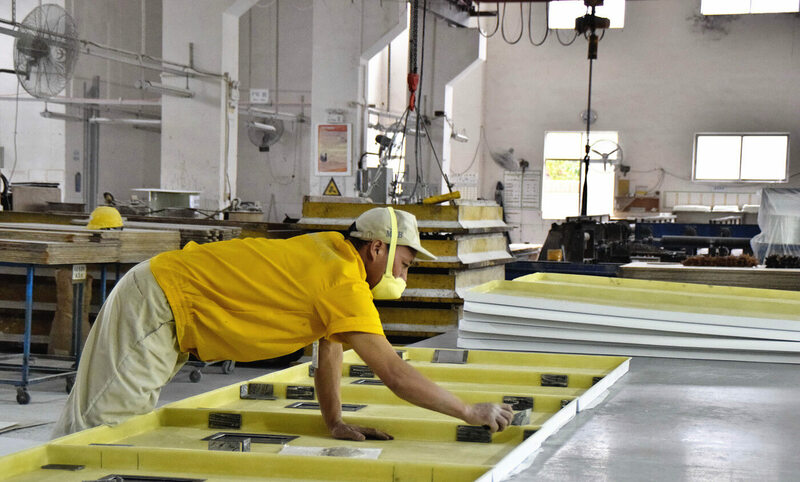 We are also one of FRP train interior parts suppliers China, which mainly use FRP layup for car body parts manufacturing. As we all know, there are four main FRP process. Hand layup process, fiberglass pultrusion, compression molding, filament winding. In general, the current two major problems of electric vehicles are their endurance and quick charge. However, the improvement of quick charge belongs to the category of electronic industry. We are here to talk about endurance. There are several ways to improve the battery life when the electricity is stored equal. For example, reducing the wind resistance, reducing self-weight, improving engine efficiency, and so on. And the most effective way to improve it is to reduce self-weight. Experiments have shown that cars with a self-weight of 1360kg can save about 8% of their energy consumption by reducing their weight by 10%. The main way to reduce the self-weight of the car is to use lightweight materials. They can replace the iron parts in the old process. Density of FRP is relatively low, FRP weight is light, and currently the most suitable alternative is FRP material. FRP profiles have sufficient rigidity and good impact resistance, those fiberglass body parts can meet the basic safety requirements. The composite GRP has a sufficient hardness and toughness. It can help to remove some effect of the impact or produce a rebound, when the body is slightly bumped. As the glass fiber plastic content increases, the mechanical properties of FRP composites are correspondingly improved. As GRP material has good plasticity, and is easy to shape. So it can have the late joining together, but also splice with other materials parts. Many domestic and foreign automobile manufacturers and research institutions favor the FRP composites long before. As early as 1955, Europe began to use fiberglass cars, and tried FRP board on the STM-III. In 1970, Japan used fiberglass material to manufacture automobile wheel trim covers. Japan Suzuki begin making fiberglass hood, making fiberglass fenders and fiber glass bumper in 1971. And in 1974, the United Kingdom ERF do a successful trial of the FRP driving cab. When the time comes to 1979, Chrysler Corporation of America manufactured fiberglass car parts in the rear of the auto. In 1980, America GM used GRP material to make car doors of passenger and goods double-service trucks. And the company’s FRP driving cab was formally used on “General” trucks in 1983. At present, many international corporations choose China FRP panels manufacturers, China GRP flat sheet factory to cooperate. In addition, FRP has also been widely used in domestic automobile enterprises. We China FRP flat sheet manufacturers and China FRP panels suppliers then become popular. The successful development of the BJ121 FRP cab at 251 in Beijing has laid a solid foundation for FRP in domestic automotive applications. Then after a short while, the first automobile manufacturer successfully developed the fiberglass fenders and flat head cab that can flip. Under the influence of the domestic automobile industry, there are more FRP application in the domestic automobile industry in the late 1980s. In 1986, Shandong Wucheng travel car factory, an train interior parts factory successfully developed the BWC-6440 travel car with full fiberglass car bodies. The plant also developed BWC6470, BWC6480 with full fiberglass car bodies. They passed the 30,000 km reliability test and crash test in 1992. When the time comes to 2013, Zhongshan University Research Institute of Guangdong Province and Dongguan MIYABI-FRP Limited successfully developed a electric bus with full fiberglass car bodies. 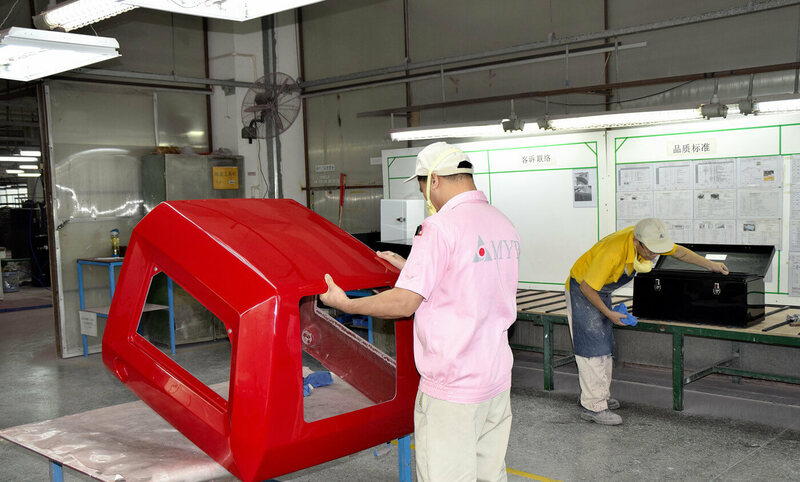 According to the survey, many automobile manufacturers are working on how to make a fiberglass car body, and some have a little success. The traditional body structure is composed of a large number of steel plate stamping parts and tensile pieces spliced ​​together. You need a variety of large stamping equipment and a large number of stamping dies and other technology and equipment. However, uses of fibre glass can greatly reduce FRP moulding. 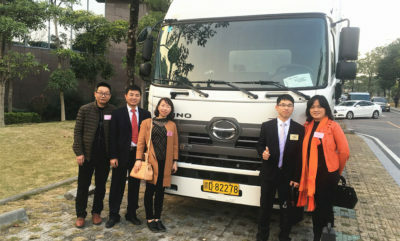 Zhongshan University Research Institute originally designed more than 100 stamping parts of the electric bus body. After the optimization of Dongguan MIYABI-FRP Limited, it reduced to 22 pieces. 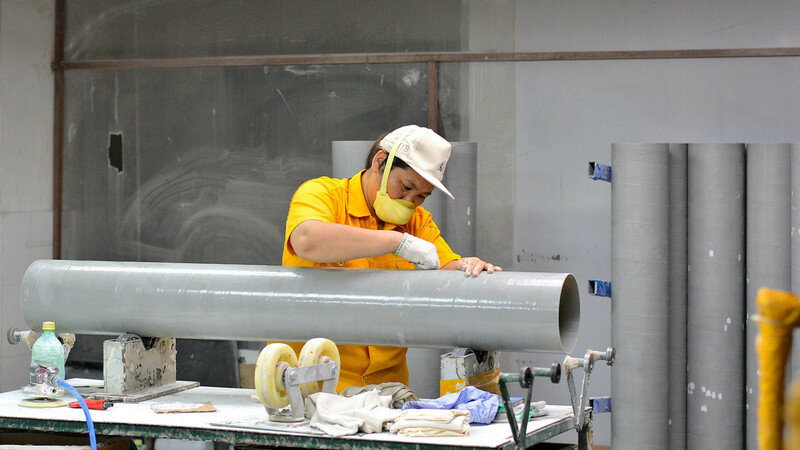 Fiberglass bodies need a small number of FRP moulding. It can save a substantial amount of research and development funding for fiberglass car which the overall fiberglass design has not been finalized. If there are minor changes of model later, some fiberglass car molds can be modified. 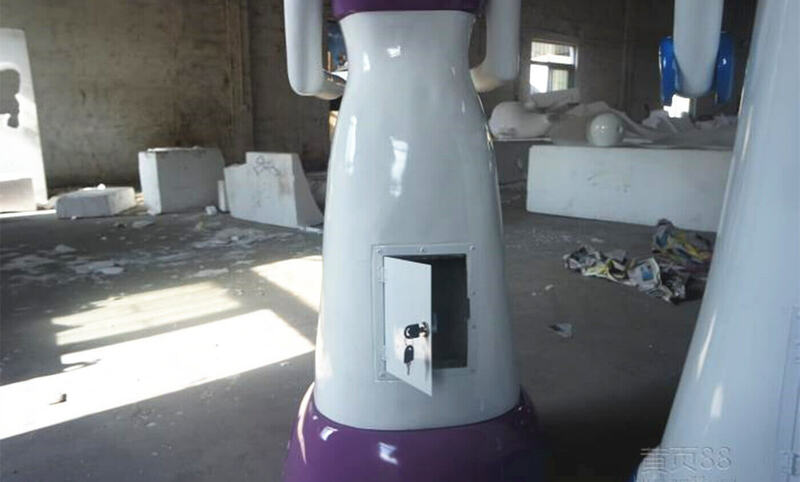 Even if we open the mold again, the FRP cost is not high. 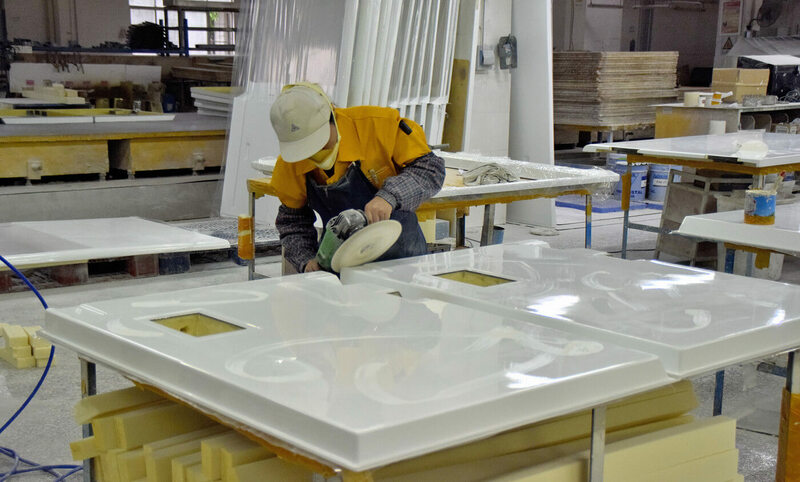 When manufacturing panels with same rigidity, FRP light weight ratio can be up to 36.7%. As FRP density of the body is only 1.7g/cm², about 1/5 of the steel. Although the FRP thickness and intensity increase, it’s still lighter about 100kg than the metal auto body. Making FRP profiles, fiberglass fenders, DIY fiberglass hood, FRP carriage, FRP door and FRP cab, American Rockwell company do success. Depending on the light FRP density, it reduces the vehicle’s weight by 227kg. Beijing 251 factory produced FRP cab of BJ121 car, FRP cab weight is only 1/3 of the original metal cab weight. We produced electric buses with full fiber car body, the total FRP weight of the vehicle reduced by 18% than its own design weight. As the decrease of body weight, it is bound to reduce energy consumption. FRP material is able to meet the strength requirements of the car body. Fiat did a passive safety experiment with Fiat150 car FRP cab. And when we put a load which is 50% more than steel cab on top of it, the column will not deform visibly. 40kg weight pendulum from the Drop impact at 2m height of the cab, the enclosure does not occur any deformation, while steel products would produce visible deformation. In general, the above test fully demonstrated the impact resistance and high strength of FRP plug-in safety performance. We China FRP pultruded products factory and China GRP pultruded profiles factory provide great FRP solution. In addition to the strength advantages of FRP, it offers shock absorption, thermal insulation, sound insulation and an exceptionally high UV resistance. Under normal circumstances, the general life expectancy of fiberglass reinforced polyester body shell can be up to 15 years. There is ±1% change in rigidity when the temperature ranges from -40℃ to +70℃. It won’t deteriorate in the -70℃ to +100 ℃ temperature range. And the FRP strength even increases at low temperatures. The life of ordinary metal body is only 3 to 5 years in hot and humid areas, saline-alkaline waterlogged areas and coastal areas. However, it has no impact on FRP profiles. It’s inevitable that the future development of new energy vehicles is inextricably linked with FRP. Before new materials which are more suitable for bodywork have not been discovered, we should actively explore and improve the process. Especially, we China FRP flat sheet factory, China FRP composite panels manufacturers and China FRP foam sandwich panels manufacturers should seize this opportunity. So that FRP can grasp the present moment of excellence. What’s more, we not only provide FRP panels, but also are China radome manufacturers and China FRP pultrusion factory. And we are a stable FRP train interior parts factory for many famous international corporations. Since many of our engineers have over 10 years experience in field, we will enjoy our professional and comfortable service.